The Live Streaming web based software can easily be used with Moodle sites to build live video interactive virtual learning management systems . 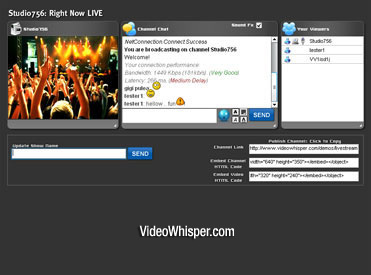 Live Streaming contains an application to broadcast video with realtime configuration of resolution, framerate, bandwidth, audio rate and allows discussing with video subscribers. This Live Streaming edition integrates into Moodle as an activity module so live video channels can be added to courses as activities. We recommend using this with latest Moodle version. Was tested with Moodle 2.0.1+. You will find multiple details about Moodle Live Video Streaming module activity on this page: demo, how to install, how to configure, how to use, activity settings and permissions, how to customize, how to uninstall/upgrade, all plugins for Moodle. Download the zip file and unzip it to your moodle/mod directory. To verify everything is in the right location, see if you have mod/livestreaming/README.txt . The Moodle integration is based on a slightly modified php live streaming edition so you can also check that for customizing settings, integration and implementation of other features.